One of the challenges in protein formulation is the simultaneous evaluation of multiple key formulation variables in a rational fashion. The Design of Experiments (DOE) approach has gained significant popularity in protein formulation as well as other process development activities. HTD Biosystems has developed a robust DOE approach for protein formulations referred to as iFormulate™ that utilizes advanced response surface quadratic modeling to evaluate the effects of four formulation variables in a multivariate fashion. The procedure allows for rapid identification of stable protein formulations, using only small amounts of material. 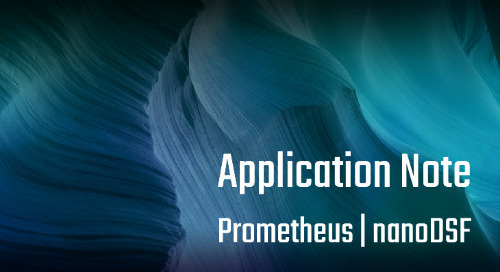 By analyzing the thermal stability of a model protein, Lysozyme, using the Prometheus NT.48 in conjunction with the iFormulate™ DOE approach, we demonstrate that ideal formulations can be identified in as little as 35 minutes with minimal sample consumption. The DOE analysis of the precise and reproducible data generated by NanoTemper Technologies Prometheus NT.48 from 25 trial formulations resulted in the identification of the formulation design space for lysozyme formulations with high melting temperatures Tms). The formulations can be rationalized using Quality by Design principles from the DOE analysis. Thus, by using the predictions from the DOE output and high-precision thermal stability analysis by nanoDSF, stable formulations of proteins can be generated and validated with unprecedented speed and precision."